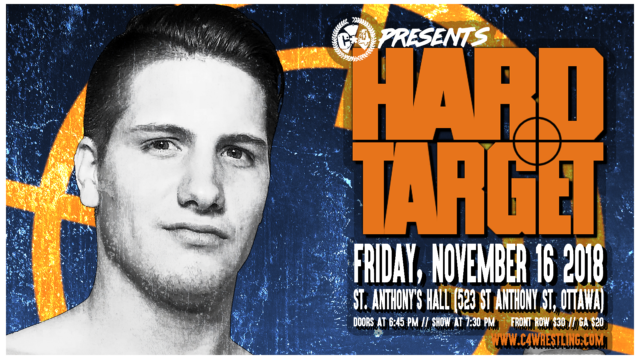 C*4 presents "HARD TARGET" - 11th Anniversary event! Capital City Championship Combat Fan Community > C*4 Fan Community > C*4 Discussion (Moderators: Matt Fortune, RotchyKongISW, C*4) > C*4 presents "HARD TARGET" - 11th Anniversary event! Re: C*4 presents "HARD TARGET" - 11th Anniversary event! #C4HardTarget – 11th Anniversary Celebration! Main Event set! On November 16th, we celebrate our 11th (!!!) anniversary! We’re going to have an absolutely STACKED event for all of you. As we excitedly race towards our next show, we have our first official announcement. 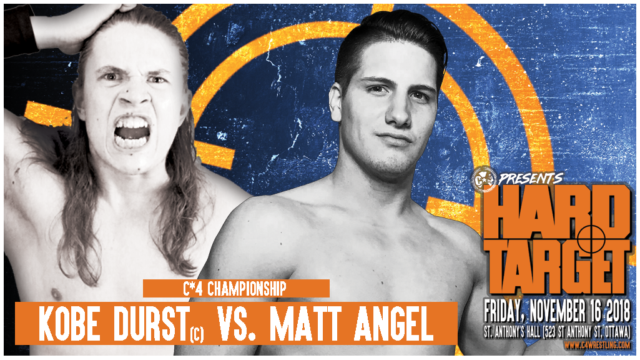 With his win over Stu Grayson at #C4AnimalHouse, Matt Angel has secured his place as the top contender to “Diamond Tiger” Kobe Durst’s C*4 Championship. Since ending the two-year plus reign of Mathieu St. Jacques, in September 2017, Kobe Durst has been on a mission to silence his critics. He’s taken on every challenger to his Championship, and somehow time and time again, walked out still on top. In April at #C4EndOfDays, it was the surprise partnership of Matt Angel who aligned himself with TDT and Stu Grayson, helping his team overcome Durst, Evil Uno, FTM and Twiggy. In May, Angel received an opportunity in a four-way match against Kobe Durst. However, he came up short – but was not pinned. In August, at Fighting Back, Angel managed to last eliminate Durst to win the Fighting Back Invitational: Over the Top, to claim the Fighting Back 2018 Championship – and secure a future Championship match with Durst. In September, Durst managed to sneak a victory in over challengers and Stu Grayson, in somewhat controversial fashion. With his victory over Grayson at #C4AnimalHouse, Angel will finally get a one-on-one Championship opportunity. Can Angel do what PCO, Teddy Hart, Mathieu St. Jacques, “Bad Boy” Joey Janela, Buxx Belmar, Eli Everfly, Josh Alexander, Pinkie Sanchez, and others have failed to do? Or will Kobe Durst add Angel to that ever-growing list? #C4HardTarget – Huge Singles Battle signed! An exciting return! We’ll be announcing tons of stuff in the coming weeks, as we head toward our November 16th, eleventh Anniversary spectacular event! 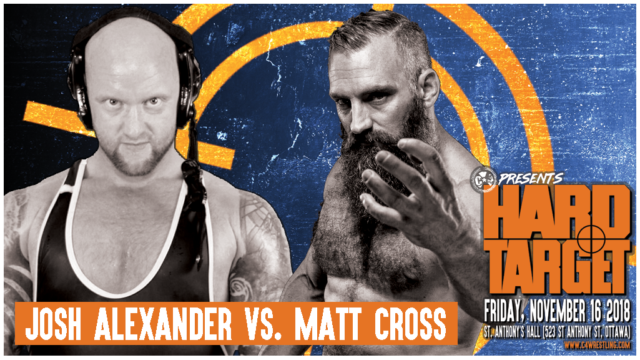 We have a major singles encounter signed – featuring a long-overdue return to Ottawa against the fans-christened “Gate Keeper” of C*4. Josh Alexander – a man who has been on fire over the last several months in C*4. Looking to climb back into Championship contendership status. Never backing down from an opponent. Always ready for a challenge. On November 16th, Josh Alexander’s call for competition has been answered against an independent wrestling legend. A man who has wrestled around the world for the better part of the last two decades… And taken the very best to their limits and beyond. 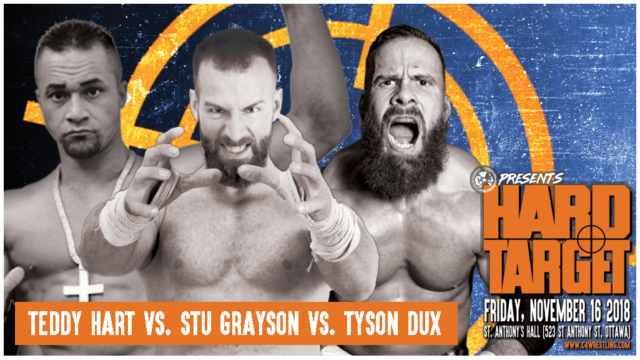 Returning to Ottawa for the first time in over five years (Fighting Back 3), and making his official C*4 debut… Lucha Underground star, Son of Havoc… the one and only… MATT CROSS! #C4HardTarget – Get ready for a Frat House Brawl! Since last May, The Fraternity, Channing Decker and Trent Gibson, have been on a roll. Undefeated in C*4 competition, they have scored wins over several of the biggest teams in the promotion. Several of those wins have been at the expense of perhaps C*4’s most decorated tandem, Thomas Dubois and Mathieu St. Jacques, Tabarnak De Team. Following TDT’s victory last week at #C4AnimalHouse, the duo was told they were in line for a Tag Team Championship match on November 16th. However, St. Jacques and Dubois have made it clear to management, that before they can move forward, they need to even the score with The Fraternity. The Fraternity however, have made it clear that they don’t feel they have anything more to prove to C*4 or TDT, and deserve a shot of their own at the Tag Team Champions. 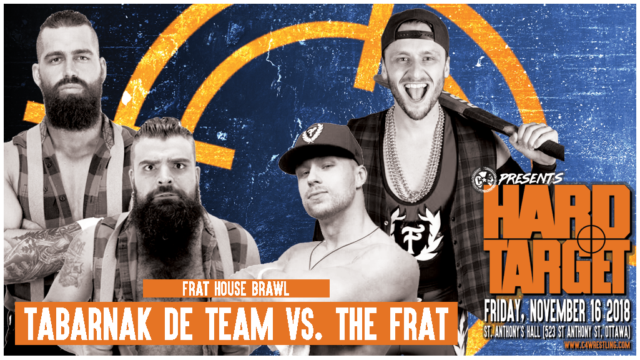 However, they have agreed to face TDT one last time under one condition… This match will be held under FRAT HOUSE BRAWL rules! No tags. No Disqualifications. No Count-outs. Weapons legal. Basically… ANYTHING GOES! TDT have happily accepted the challenge. We’ve got another match-up signed, as we continue to push towards our 11th Anniversary event, #C4HardTarget. Since C*4’s very first show in 2007, the man who would become Jonathan Rukin has grown into one of the most well rounded competitors on the roster, and the Ottawa scene. Predominately known for his tag team work over the last several years, Rukin has been on a bit of a breakout in the singles division. On November 16th, Rukin will have a shot to establish himself as one of the top talents on the roster. His opponent is a man who has been dominating the competition since his debut last spring. In his second match in the promotion, Benjamin Tull proved himself to be a force to be reckoned with, as he captured the C*4 Underground Championship. Tull has been known as one of Quebec’s top talents for many years… And he hopes for continue to prove himself in C*4, and show the world what he can do. At #C4HardTarget, these two men will collide. 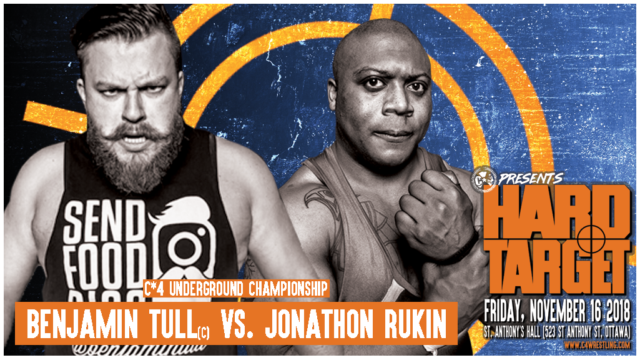 Two veterans will do battle with the C*4 Underground Championship on the line! In three weeks we celebrate our 11th Anniversary. 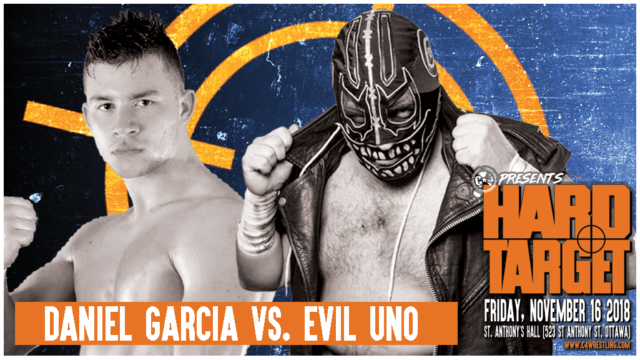 We’ve got another crazy match signed, that has show-stealer written all over it! Three of the most well rounded talents from across Canada collide in a huge three-way dance! GA Tickets available NOW at VERTIGO RECORDS (193 Rideau Street, Ottawa)., Otherside Tattoo (561 Gladstone Ave.), The ODDs & SODs Shoppe (1527 Merivale Road), and St. Anthony's Hall (downstairs bar). #C4HardTarget – Tag Team Championship Match signed! 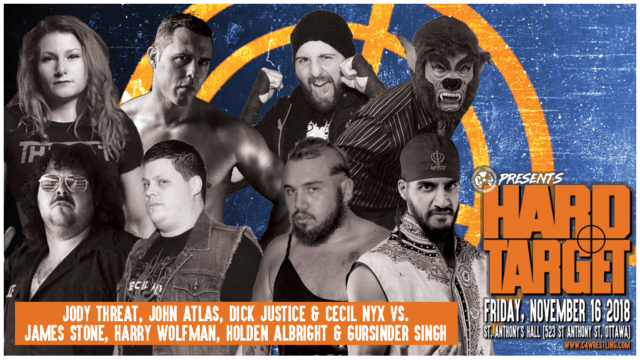 Next Friday, we celebrate our 11th anniversary as we present #C4HardTarget! We’ve got another exciting contest set, a match for the C*4 Tag Team Championship! On one side, the two-time Tag Team Champions, Fight or Flight defending for the first time this season. 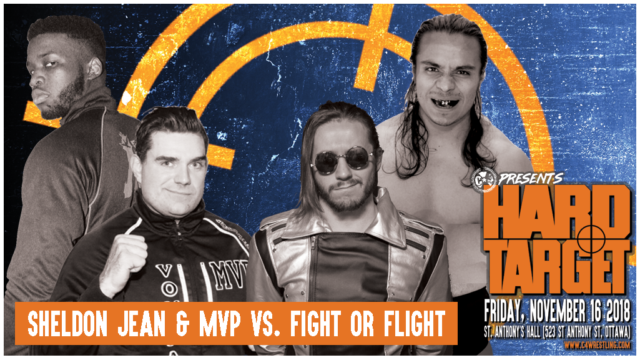 Their opponents… a team that scored a major upset on September 14th, over both TDT and The Fraternity… The team of the veteran Michael Von Payton, and the fast-rising newcomer, Sheldon Jean. Can they score another major win? First up, yet another potential show-stealer has been signed. On one side of the ring, a C*4 day one original talent, who competed against virtually every talent who has entered an Ottawa ring… The man who over the last several years has relished in his dark side. The one and only Evil Uno. His opponent, is a young man who will have his first singles match in C*4 on November 16th. A man who is a standout rookie out of Buffalo, New York, and turning heads in every match he competes in. We are pleased to welcome back the “Red Death” Daniel Garcia! And finally, rounding out the card, and over-stuffed, and sure to be entertaining, eight person tag team match! We’re pleased to welcome several debuting talents, colliding (and teaming) with several C*4 vets. This will be a fast-paced and exciting contest, filled with several huge personalities!